This is SOFAAR’s first annual exhibition. The opening reception is this Sunday, August 28th, 2016 from 1 – 3 p m in the Chapel Gallery at ArtsPlace, 396 St. George Street in Annapolis Royal. The exhibit runs through September 25th so if you can’t make it to the reception, you will have time to visit the exhibit. This is a a curated exhibit. Pieces were chosen by Bonnie Baker from submissions. Stitch-In during Arts Unleashed on August 23rd. Please join SOFAAR members in Annapolis Royal on Tuesday, August 23rd from 1-4 pm for a stitch-in. This event will take place at Mrs. Nicholson Home at 212 St-George St. It is part of Annapolis Royal’s Arts Unleashed 9-day celebration of arts and culture. Bring a portable project and a chair. There will be room for stitchers outside and in! Let’s show everyone how versatile “fibre” can be. And on August 28th from 1-3 pm there will be the Opening Reception of SOFAAR’s first annual exhibition at the Chapel Gallery at ArtsPlace, 396 St. George Street in Annapolis Royal. That exhibit will run through September 25th. More events planned in September and October so stay tuned. Call to fibre artists to create a leaf! Asha Croggan is member of SOFAAR who does volunteer work with Suicide Prevention. Every year, for their annual gathering, Asha organises what she calls a Community HeART project. This year the theme of the gathering is The Power of Community and the symbol is a TREE. Asha is looking for fibre artists to create a leaf – or several – for the tree. The leaves will be distributed to all the participants at the Suicide Prevention gathering and they will attach them to the community tree in honour of someone they care for and/or in honour of the commitment they are making to strengthen our collective community. Details of how you can participate by making a leaf (before the September 5th deadline), can be found in the attached document. 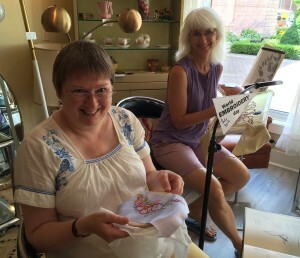 Susan Caley-Purdy and Christine Igot stitched for an hour down at Mrs. Nicholson Home in Annapolis Royal in honour of World Embroidery Day on July 30th. Many people were interested to learn there was a World Embroidery Day! Also snapped a photo of a visitor’s tattoo! 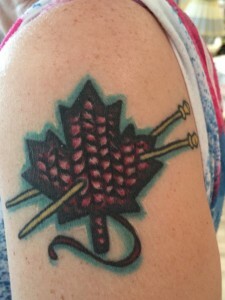 She calls herself a “hard-core Canadian knitter” and this tattoo is the proof. We all celebrate our love of fibre in many ways. 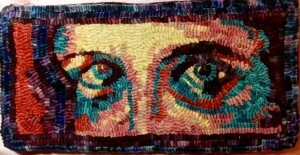 Celebrating a love of stitching! Susan and Christine stitching in Annapolis Royal.